Please note that only the products sold by the seasons&stars are already pre-strung and can be hung directly. Others need DIY have no quality and after-sales guarantee. Recently, we received feedback from other consumers that the products purchased from other sellers will be short of letters or accessories, or have no assembly at all, and need to be DIY.If you buy from us, you will not have these problems. We have checked them one by one. If you are not satisfied, you can get a full refund. * Size: 5.2" x 6.7"
Ready To Use:They are Pre-strung banner, never worry about fumbling to string the cards, just enjoy your happy time ! All the letter cards assembled to one ribbon,if you want to hang two lines, you can cut the ribbon and adjust the position.Please note that only the products sold by the seasons&stars are already pre-strung and can be hung directly. LIFETIME GUARANTEE: The best product and service for you only offered by seasons&stars! Offer fast delivery and good quality, FULL REFUND or new REPLACEMENT,you can rest assured purchase.And we will be glad to receive suggestions from you too.Recently, we received feedback from other consumers that the products purchased from other sellers will be short of letters or accessories, or have no assembly at all, and need to be DIY.If you buy it from seasons&stars, you will not have these problems. SIZE MEASUREMENT: Each banner card is at the size of Height 6.7" × Width 5.2" and the length of the ribbon is about 9ft. You can adjust the position of every card. TOP QUALITY:These aren't cheap banners which are made of fabric with Jungle colors; Glitter gold foil dinosaur flag and letters,no fading and no odd smell,it looks very shiny and shimmering,durable enough to be used over and over. 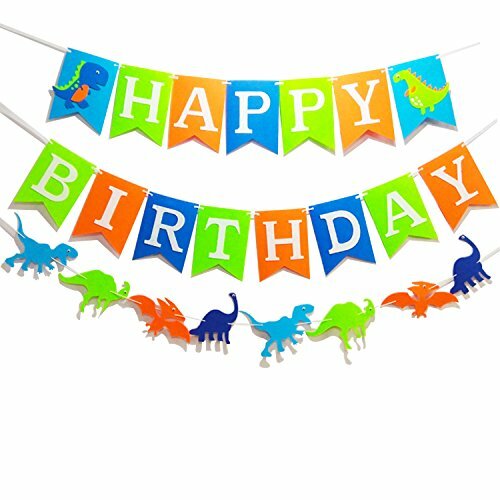 Happy birthday to your kid!Boys' best loved dinosaur banner make the birthday party full of happiness and magic. If you have any questions about this product by Seasons Stars, contact us by completing and submitting the form below. If you are looking for a specif part number, please include it with your message.